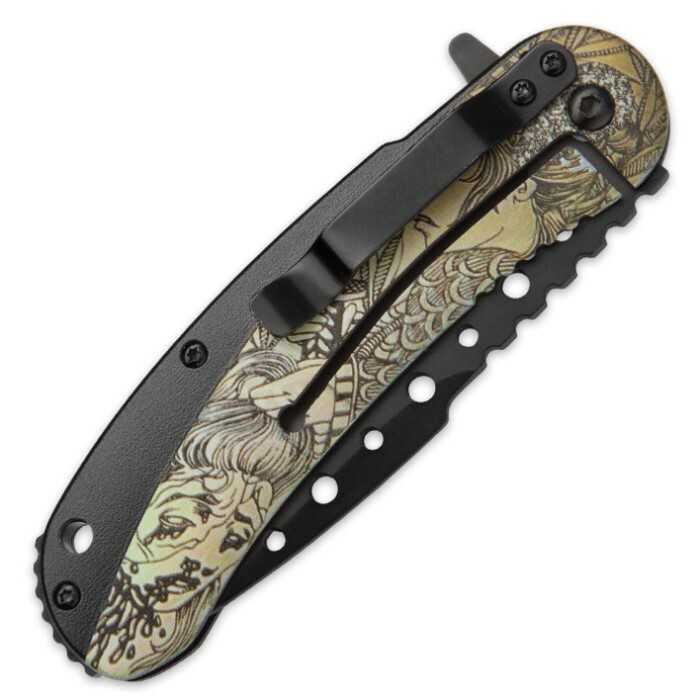 Like the knife itself, the exquisitely detailed art that graces the handle of the Boshin Warrior Pocket Knife is both beautiful and brutal. A solemn-faced samurai warrior grasps the long hair of a freshly severed head in this breathtaking Asian ink wash-style illustration. Like scarlet tears, drops of blood weep from the beheaded victim's eyes, trickling down his drooping face onto the ground below. The samurai gazes down reflectively, still firmly gripping his bloody katana. For added authenticity, the mesmerizing scene is impeccably rendered on an aged parchment-colored background and mirrored on both sides of the Boshin Warrior's tough two-tone resin handle. But this capable assisted opening folder is far more than just an elegant canvas. It packs ample "beast" to balance its superb "beauty." The black-coated 3 3/4" stainless steel drop point blade is savagely potent, with a resilient edge carefully honed to razor sharp. Stately through-holes smartly accent the blade spine, which also includes handy thumb grooves for improved control. Like a nimble samurai brandishing his sword in the heat of battle, the Boshin Warrior's blade opens with incredible speed and grace. Just nudge the flipper, and the blade deploys in a lightning fast blur of black, thanks to the advanced assisted opening mechanism. With its undeniable allure, the Boshin Warrior is perfect for display, but it also makes an outstanding everyday carry. At 4 5/8" closed, it fits easily in jeans pockets and stays secure with the built-in pocket clip. The integrated lanyard hole offers yet another convenient transport and/or tethering option. 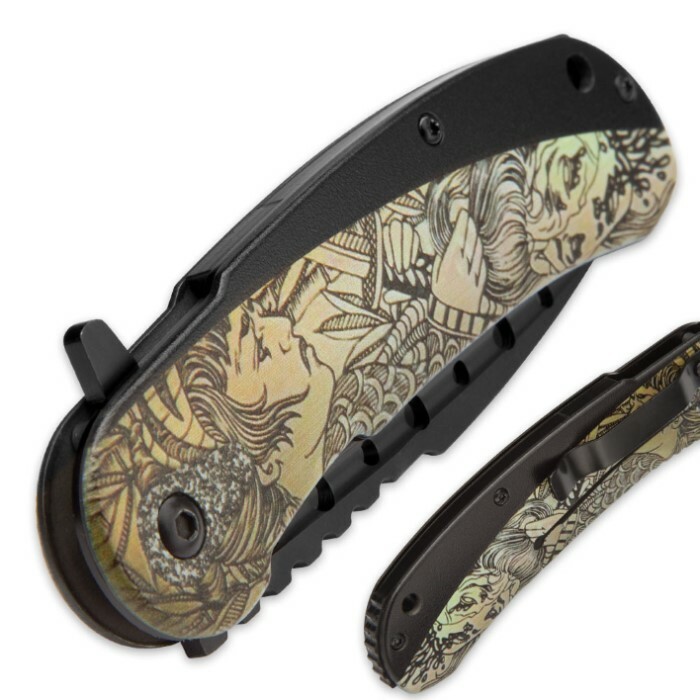 Packed with beauty, potency, strength and poise, the remarkable Boshin Warrior Assisted Opening Pocket Knife has the heart of a samurai. The Boshin Warrior Gold Folder is a good knife. It's priced right,looks good,and the assisted open part works good. I bought more than one and I'm glad that I did. 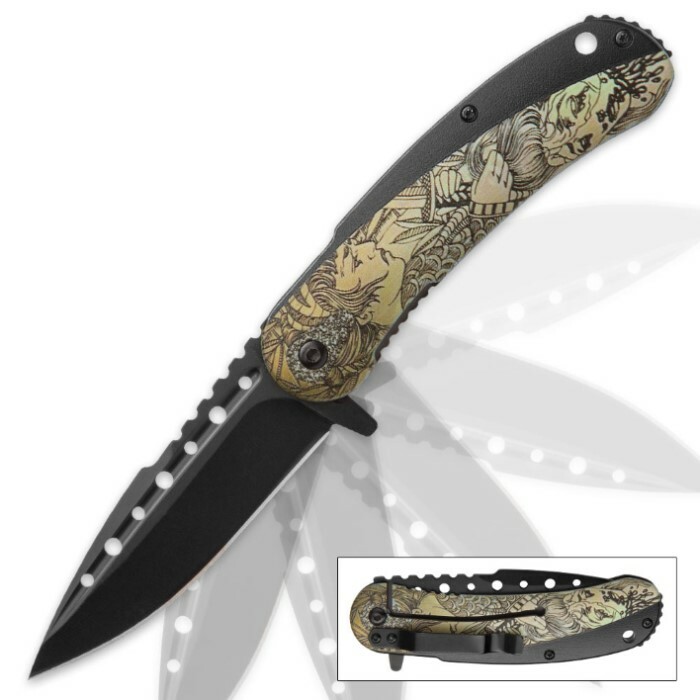 The best feature of this knife is the art work is on both sides of the handle. The blade took a ferocious edge in about "2" minutes. That said, this item is an unbelievable value at only 5.98 dollars with free shipping. "5" ????? stars way up! Great art work on the handle. Love the warrior holding the severed head. Fast and sharp. This knife rules! Thanks BudK!